The day we got to Kununurra started WAY too early. As the clock ticked over past midnight, Are You Lonesome Tonight and I was only 19 thundered from (respectively) the vehicle cab and the top-of-the-range caravan parked next to us in Timber Creek. Yes, you’re right. You’d have to be VERY drunk for that to sound good. A couple of hours later, our lonesome loser neighbour finally dropped into a drunken stupor putting an end to the impromptu musical experiment and our misery. Two bleary-eyed hours drive west got us to the border (the flat tyre didn’t help) where we scored an extra 90 minutes, courtesy of the time difference between the Northern Territory and Western Australia. Making it about 9:00 am, WA time! 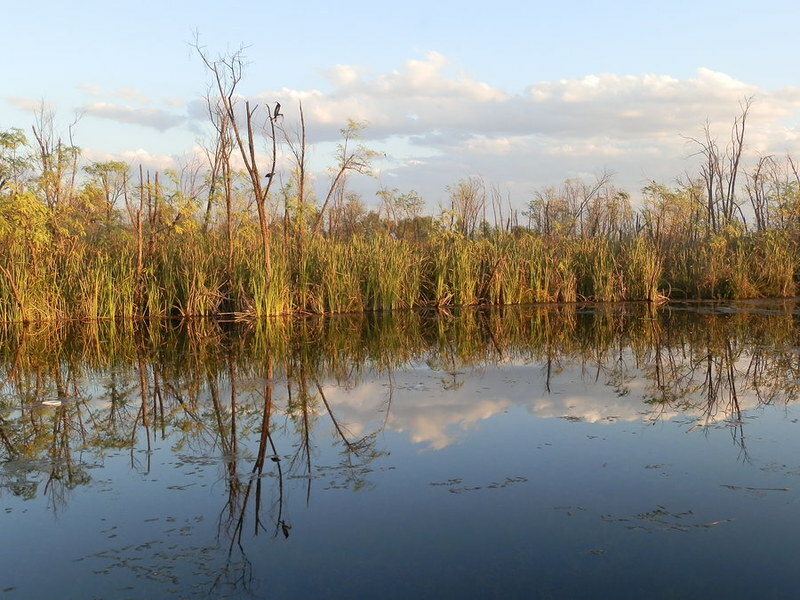 Half an hour later, the different world of our camp-site at the Lakeside Resort Caravan Park on the shores of Lily Creek Lagoon – with lonesome losers noticeably absent – made an excellent base to explore the attractions of the East Kimberley. There’s a LOT to see and do for independent travellers who like natural attractions, and so our four-day stay became 10! Here’s my TOP 10 things to do in Kununurra! 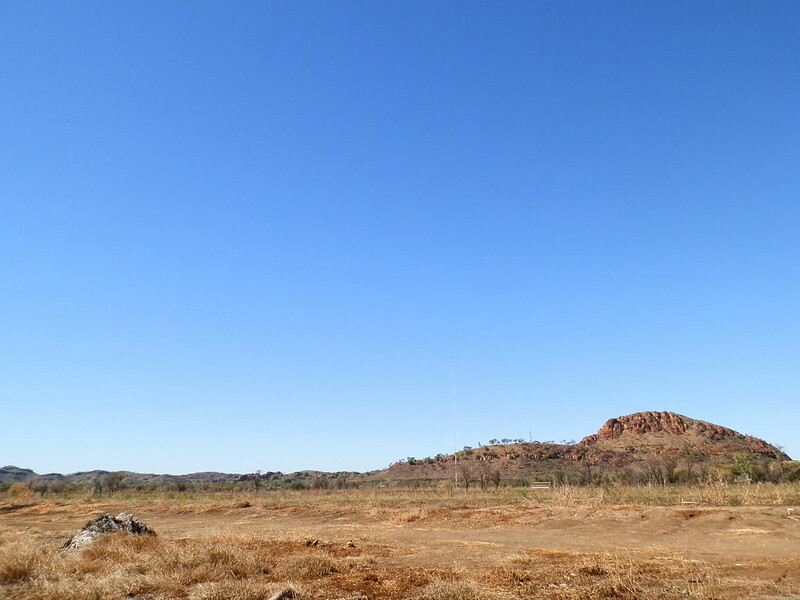 It’s convenient that the best view of Kelly’s Knob in Kununurra is from the Ivanhoe Café! Or is that just MY opinion?? After a session at the cafe, work off the spectacularly fabulous icecreams, smoothies and other goodies chock-a-block with awesome Kununurra produce by climbing to the vantage point at the top to get your bearings AND enjoy the spectacular view over the town and mountain ranges beyond. The landscape’s surprisingly green in this part of the East Kimberley, courtesy of the Ord River Irrigation Scheme. 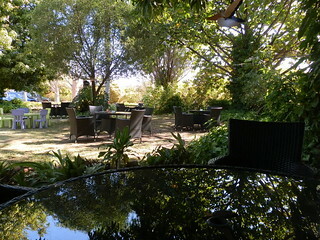 And you may have to visit the Ivanhoe Café several times to prove that it really IS the best place from which to see it! Why the excellent Anzac Hill Lookout we stumbled upon just out of town heading west doesn’t appear in any of the tourist information I’ll never know … track it down for yourself and see which one you prefer! 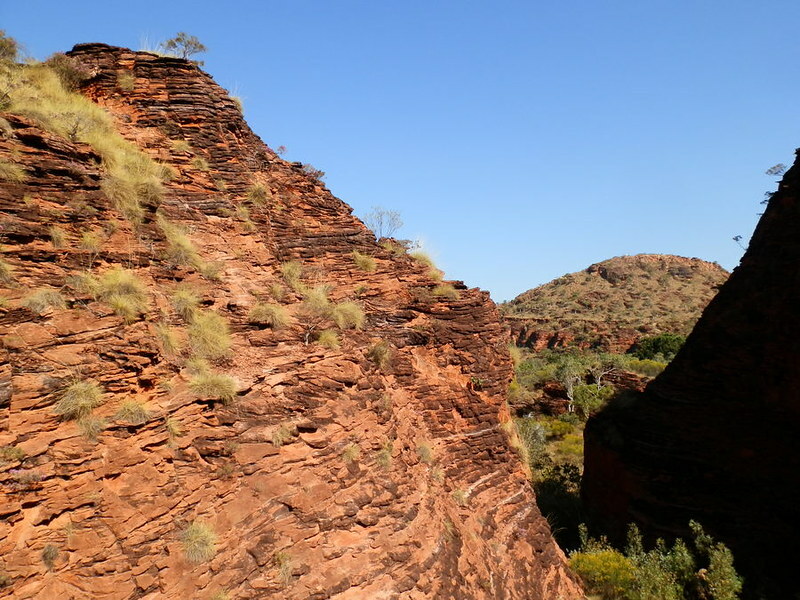 The East Kimberley’s natural attractions can so spectacular they overshadow its hazards. 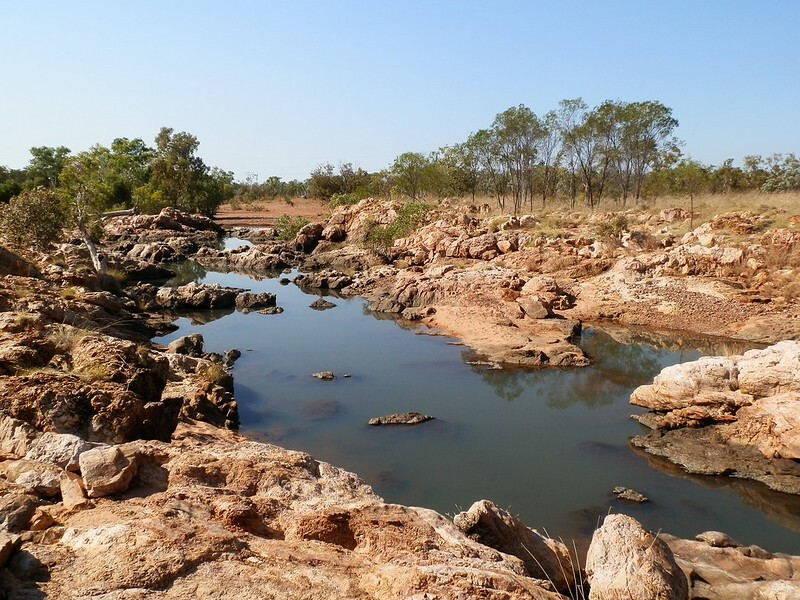 And that could be fatal in Kununurra – because while the Ord Irrigation Scheme has turned this harsh landscape into a food bowl thanks to the Ord River Dam, it didn’t get rid of the crocodiles! There are plenty of reminders of the dangers along the river banks – but don’t let that stop you fishing for barramundi (does anyone bother with any other types of fish? 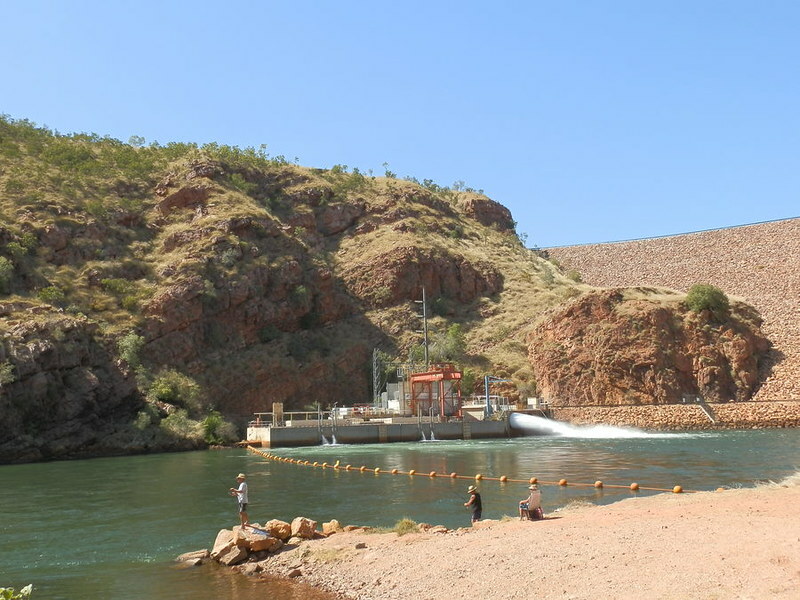 ); having a picnic; or even taking a cruise upstream for 57 kilometres to the Lake Argyle Dam Wall. No boat? No problem! Local cruise operators will be happy to see you on board! But no matter how hot it gets, don’t even THINK about going swimming! The arid Carr Boyd Ranges near Kununurra aren’t where you’d imagine an inland sea over 1000 km² to be. If that’s what you thought, you’d be right. 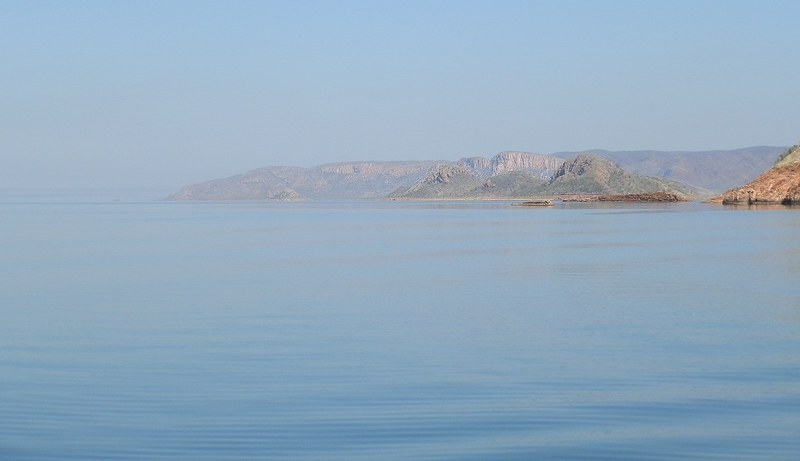 Lake Argyle, Australia’s largest body of fresh water, didn’t naturally occur. It was formed when the Ord River Dam was slapped across the river’s narrowest point in an incredible feat of engineering that drowned valleys, pastoral leases and a whole mountain range! But its staggering scenery is SO worth the ~70 km drive back south-east towards the WA/NT border we did it twice, the second time for the morning cruise. And the proliferation of scenic public loos! And the wildlife – over a third of Australia’s birds can be found here at various times of the year! They say the damming of the river means there’s no saltwater crocodiles above the dam wall, although there have been sightings. But the absence of predators means the less dangerous freshwater crocodiles have proliferated out of all proportion. SO … if you’re crocodile-averse, don’t go in the water AND definitely don’t sign up for the annual swimming races! 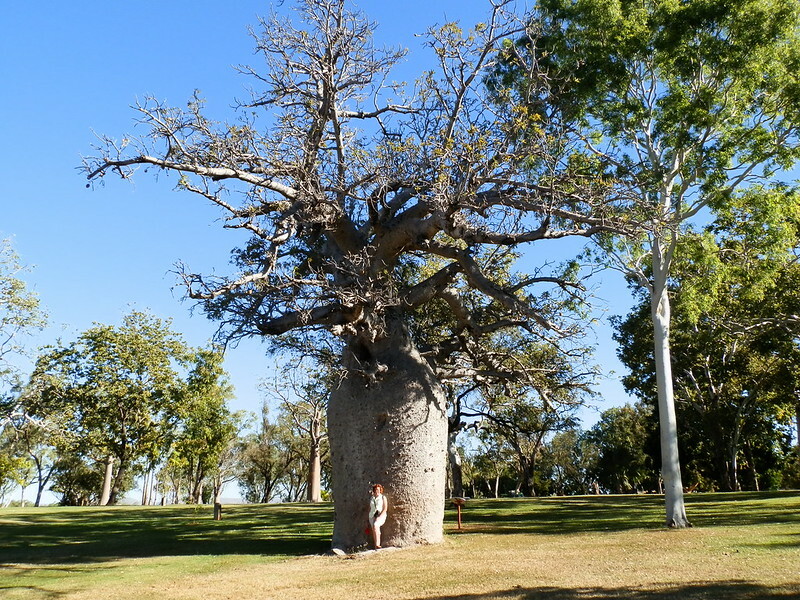 Australia’s only species of Boab tree grows almost exclusively – but plentifully – in the Kimberley. Even if you haven’t seen a Boab tree for real, its distinctive shape and silhouette appear in all the galleries – on paintings, prints, cards, carvings, photographs and jewellry. I’m still having withdrawal symptoms over the earrings that got away – how I managed to leave those brightly coloured glass squares with tiny Boab tree silhouettes in the shop remains a mystery to this day. Luckily, wild Boab trees are easy to find around Kununurra. But if you haven’t got time for hunting, they’re also found in captivity – at the Celebrity Tree Park at the edge of Lily Creek Lagoon. And although I couldn’t find a tree dedicated to Red Nomad OZ, I’m sure it’s just a matter of time! Like its giant friend Lake Argyle, Lily Creek Lagoon isn’t natural. But it’s an awesome backdrop to a rock formation that looks (supposedly) like a Sleeping Buddha from Celebrity Tree Park; and (even more supposedly) an Elephant’s head from Zebra Rock Gallery’s vantage point just down the road. It’s also a wildlife hotspot. Of course it’s a helluva lot easier to go wildlife spotting on Lily Creek Lagoon when you’re staying right on its banks. By day, watch a variety of bird-life on and around the lagoon, including Comb-crested Jacana, also called the ‘Jesus bird’, hopping around on the lily pads; and the Crimson Finches hopping around on the banks – and at our campsite. Sunset brings the Sleeping Buddha to life – at least as much as is possible for a reclining figure – and the Lagoon dramatically reflects the sky’s RED glow. But the night belongs to the crocodiles … take a torch and watch the RED glow glinting from their eyes if you dare! Wondering when the selfie-taking joggers completely oblivious to the 3 metre snake sunning itself at their feet would either notice it or step on it was like watching a car crash. Was it so wrong to have my camera ready? Luckily (or unluckily, depending on whether you were them or me), neither happened, and the joggers jogged off into the sunrise to post what could have been a REALLY exciting update (read about that adventure HERE). I waited for the snake to move so I could admire the view over Mirima National park from the top of the range vantage point on the Lookout Walk (no prizes for guessing why it’s called that! ), one of four shortish walks showcasing the park’s attractions. I can’t guarantee the excitement of a sunrise snake stand-off in the sandstone at Mirima. But you WILL see dramatic sandstone domes and valleys not unlike those of more well known Purnululu (aka Bungle Bungles). So if you don’t have time to trek there, or the bucks for a helicopter flight, Mirima National Park just outside the outskirts of Kununurra, is a cheaper, closer, and more charming alternative. The top of the range view also overlooks Hidden Valley – and the Hidden Valley Tourist Park who I mention here because they put RedzAustralia at the very top of their TOP 10 Grey Nomad blogs (even thought I’m a RED Nomad)! We’d only seen two of the four sites but we’d already experienced a grumpy grey-nomad who should have stayed in bed; and a flamboyant four-wheel-driver developing some experimental techniques in what can only loosely be called ‘driving’ (read about that adventure HERE). Who knows what other weird experiences awaited if only our car had had enough clearance to visit the Ngamoowalem Conservation Park’s 3rd and 4th localities? The spectacular setting amid the Livistonia Range means the Springs and Falls that make up the park run hot during the wet season. 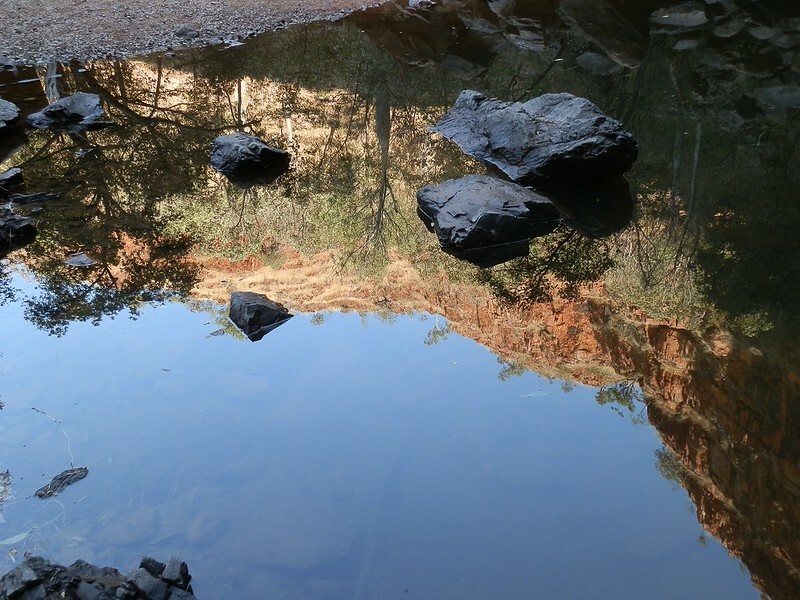 There wasn’t much water during our dry season visit – but that meant we could explore the rocks up close and admire the cluster of butterflies flitting through the undergrowth. And wonder why Black Rock Falls was called Black Rock Falls! It’s a shame we didn’t get to see Middle Spring and Molly Spring, but no matter. The other visitors to Valentine Spring and Black Rock Falls had provided quite enough excitement for one day. Besides – don’t they say you should always leave something for next time? There’s not a lot of point visiting the Ord River Irrigation zone without actually sampling the produce, right? So we gave it our best shot. A daily dose of something with mango in it – smoothies, cheesecakes, ice-cream, we weren’t fussy – from somewhere local – we weren’t fussy about that, either! We didn’t even care if they sold other products! And so we did the rounds of the Zebra Rock Gallery Café; Lovells Gallery, Hoochery Distillery, the Sandalwood Factory and a number of Open Door outlets that sold fresh produce! They say you always remember your first time. And the 2012 Kununurra Agricultural Show was where I lost it. 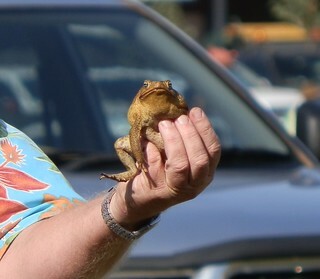 The Cane Toad Race fund-raiser for Kununurra Wildlife Rescue topped the bill of weird and wonderful events celebrating rural life – with audience participation encouraged. If you’ve never seen the Melon Olympics, where participants skate in watermelon shoes to throw honeydews into 44 gallon drums; a lawnmower race; the Kimberley Cowboy Challenge – a farmer’s daily life event multi-tasking race; and the Haystacking Challenge where a hapless volunteer perches atop an ever-growing stack of hay bales just before it topples then this is the place to be. All accompanied by even more of that killer Kununurra produce!! Frozen chocolate-covered banana, anyone? Experience the fabulous fun this year on Friday 10th & Saturday 11th July, 2015!! 10 Sunset – Kimberley Style! 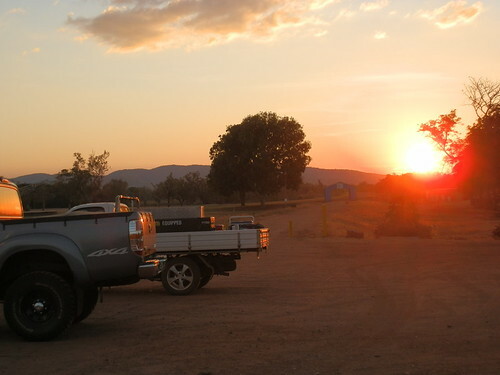 When you’ve enjoyed yourself to the max in the East Kimberley, max out a little bit more on a Kununurra Kimberley sunset. Sunset from pretty much anywhere will do, but our campsite by the lake gets my vote! With nothing but the gentle hum of mosquitoes, plopping of crocodiles and chatter of the Southern Grey Nomad to disturb you! Staying in Kununurra (where 26º C is a COLD day) for any length of time puts the careless visitor in serious danger of having a food baby. So it was just as well for us we left, albeit reluctantly, after 10 days! 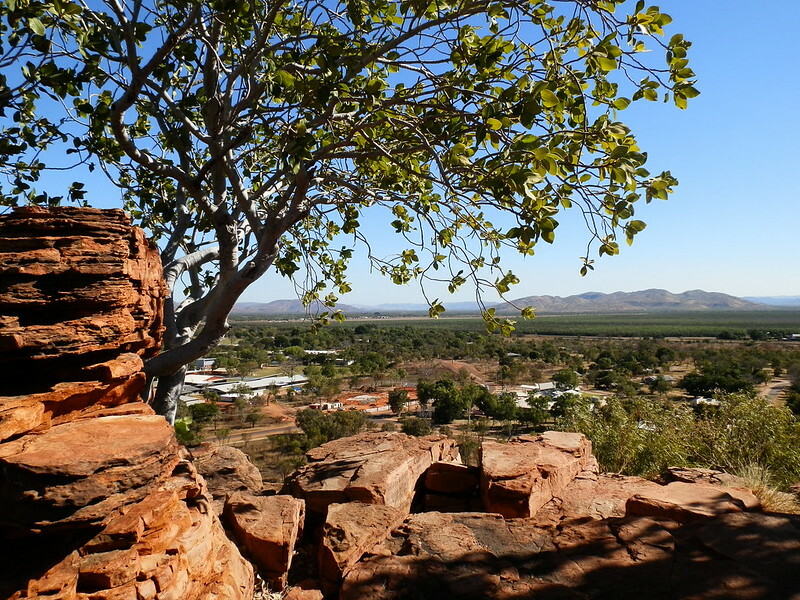 The good news is that once you’ve seen the sights of Kununurra, there’s the rest of the awesome Kimberley Region to explore (Read my 7 Kimberley Random Adventures HERE)! Having trouble getting there? Check out the best flights and get your Kununurra adventure off the ground NOW! Previous Post: Tour the Yorke Peninsula via its BEST Scenic Loos! NEXT Post: 10 TOP Things to Do in Darwin! « Tour the Yorke Peninsula via its BEST Scenic Loos! 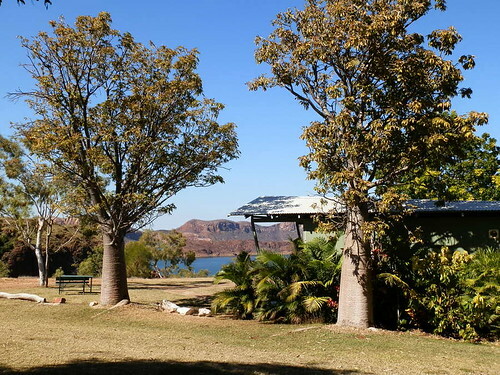 Kununurra is really an amazing place to visit, and the mention places are really good. thank you for sharing this article with us. 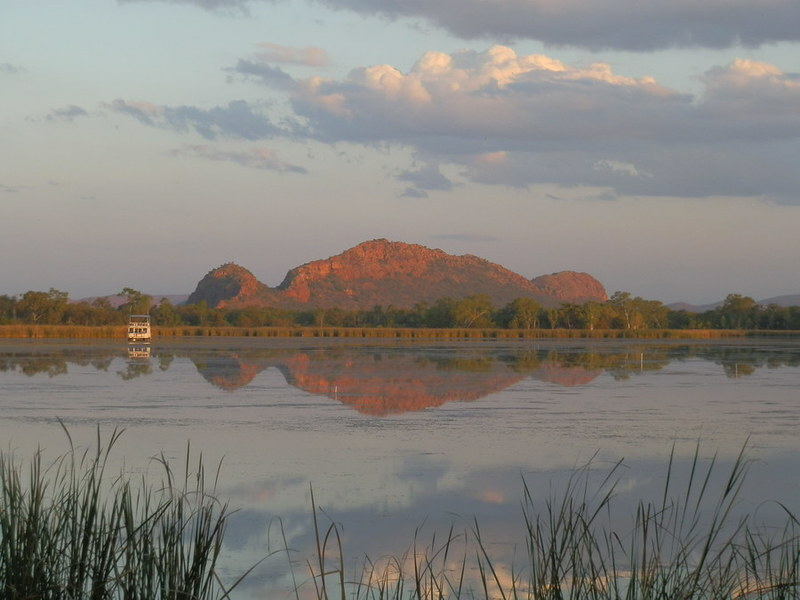 I loved Kununurra and I’m glad you found my blog post useful. Thanks for dropping by! So many beautiful photos and spots! I love that Sleeping Buddha! Great photos; some of the bits we saw, but many we didn’t! I still think Kununurra is one of the most picturesque places in Australia; it really is a stunning bit of land. the Kununurra Ag show sounds like a great event, but you can keep the cane toads. So devastating for us WA’ers that the cane toads have made it over to our side of the fence. I think our most enjoyable experience at Kununurra was the flight over the Bungle Bungles and the boat ride down from Lake Argyle. Happy travels Red. I’ve taken a leaf from your book for my blog post this week! Maybe the Kununurrans have the right idea about how to deal with Cane Toads, Jill!! When they enter the Murray-Darling river system, life as we know it will change forever. I was able to miss both your top experiences – but that gives me something to come back for!! Or should I say something ELSE to come back for! G’day Red, have a spare hour and am visiting favourite blogs (from Scotland lassie!) ha! lovin’ that red hair of yours against the boab tree! These images are spectacular and I’ll be giving your blog address to quite a few Scots – if they want to see what the ‘real’ Australia looks like, then your site is the one to visit and that’s fair dikum Marion. Even had the loo book out to bring with me and forgot it! Aye lassie, I’d best be getting moving to have me haggis…….. it’s pretty cold over here too! love it! Hey Rose! Thanx for those mega-kind words! Hope your new Scot friends aren’t put off by my ‘real’ Australia – I try to show the awesomeness as well as the reality!! I’ll know whether or not I’ve succeeded by whether or not I made you homesick??!! I just finished reading your post on my email – boy, are you rugged up, or WHAT?!?!? Not sure how you’re going to manage the humidity & heat when you get home, haha!! Feel free to share some posts on FB – that might get them all enthused to come back with you for some loo spotting 😀 As for the haggis, you’re on your own!!! Sure is lots to do and see there. I enjoyed the boat ride down the river and the millions of bats darkening the sunset. The Sleeping Buddha is awesome, especially with his reflection – great pic! Good thing you linked to your other post. All the way up to it I thought, wasn´t Kununurra the place where we visited the Mini Bungle-Bungles in 1995? Thank you Iris! Glad to see your memory hasn’t failed 😀 I actually don’t recall a bakery as such – there may have been one, but we kept ourselves topped up with all the mango cheesecakes and smoothies!! We didn’t actually get to the real Bungle Bungles on that trip, so visiting Mirima (and also Keep River National Park just inside the NT border) made up for it! I hope the real ones aren’t disappointing when I finally see them!! 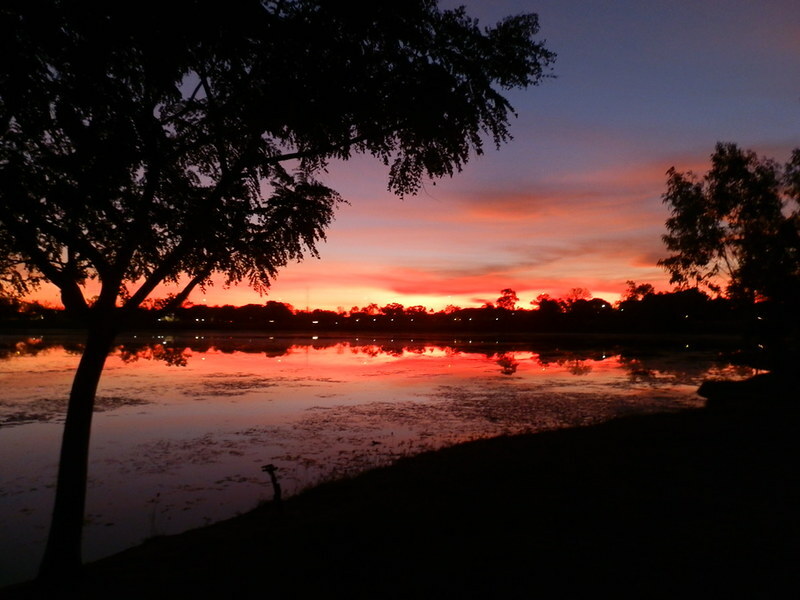 Oh that sunset over the lake in Kununurra takes me back to that exact caravan park. We only spent one night here because we wanted to get out to Lake Argyle. The colours of the escarpments that change during the light of the day was a photographers dream! Great post and photos Red! We didn’t actually stay at Lake Argyle, Kathy – although next time there’s a better than average chance we’ll be there 😀 And although I’m a fair-weather tourist and only travelled there during the dry, cooler months, I found the scenery, colours – and whole area – amazing! Lovely photos….we are going there again this year, our 3rd time..
Oh, you’re such a tease, M!!!! I don’t think we had any reason to go to Mitre 10 – and I don’t actually recall where it is! So you’re going to HAVE to put me out of my misery and tell me what the Mitre 10 thing is!! PLEASE!!! I used to imagine thousands of species of wild flowers when I talked about Western Australia. But… Kununurra is… ah… so WILD!! Strangely enough, Kununurra DOES have wildflowers, Kozue! They start a lot earlier than the spring wildflowers further south, and they’re more arid land flowers such as wattles and eucalyptus. But you’re right about the ‘wild’!!! Have a great weekend!! “It’s not always all about cake”. hmmm, I’d be sorely tempted to stay around the cafe areas and sample all the cakes and everything else too. 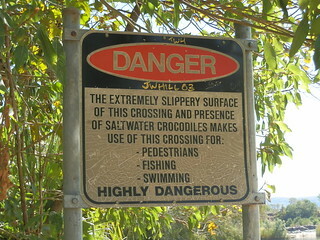 The crocodiles don’t get into that area do they? As for the annual swimming races, do they really have those? in crocodile infested waters? Probably it’s a good way to train for the Olympics, if you can out swim a crocodile…. That 3m snake looks like another shadow or crack in the ground, no wonder the joggers didn’t notice it. The final sunset is very red and very beautiful. After 10 days of cake indulgence (usually accompanied by mango smoothies, ice-cream and various other goodies) I really needed to get away and cut back on the food intake, River! 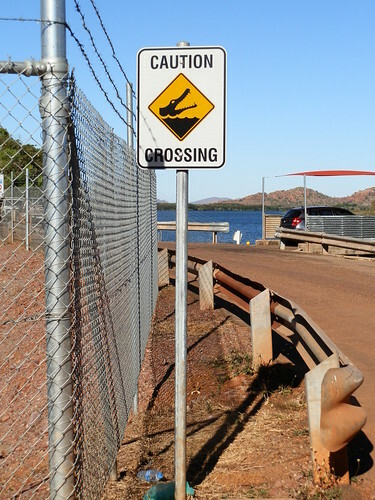 Not that I didn’t enjoy it while it lasted 😀 The crocodiles in Lake Argyle are supposedly ‘only’ freshies ie less dangerous; I guess you’d have to be a special type of person!! NOT like me – not until Mortein develops croc-repellent, anyway!!! As for the snake, it just shows how alert you have to be -looking at the pic again, I realise how well camouflaged it is! There’s nothing quite like a Kimberley sunset – but they tell me they’re even more spectacular when there’s stormy weather!! Have a great day, my friend!! I enjoyed that post so much! I had never stopped to wonder how much the Ord River Irrigation Scheme must have changed the area and I would not have imagined that Kununurra would be a foodie haven. Thanks so much for your pics and stories. It’s my pleasure, Pauline! The Ord River Scheme was so ambitious, and probably isn’t being used to its full potential, but the difference it’s made to the area is amazing. Not just food – but scenery and activities as well!! Have you been there? It’s really an AWESOME part of Australia! I’ve never baled hay, but I’ve seen some pretty high haystacks, Christie! All the same, I don’t think I’d be the one climbing to the top – the catchers would have their work cut out for them to catch me if I fell!! You’re the lucky one, Rosemary – you get to see it every day! Another wow type of post… you really do have some adventures… and I loved your opening para! A boss I once had used to travel to Kununurra regularly… I always remember his papers were stained with red earth whenever he came back! We were still finding red dust in nooks and crannies in our car 12 months after our trip to the Kimberley and Pilbara, Liz! If anything, the Pilbara is even REDDER!! Just between us, Kununurra is a foodie paradise – an amazing amount of fresh produce! Have a great day!! It is odd that boab trees grow quite happily in the cold too. 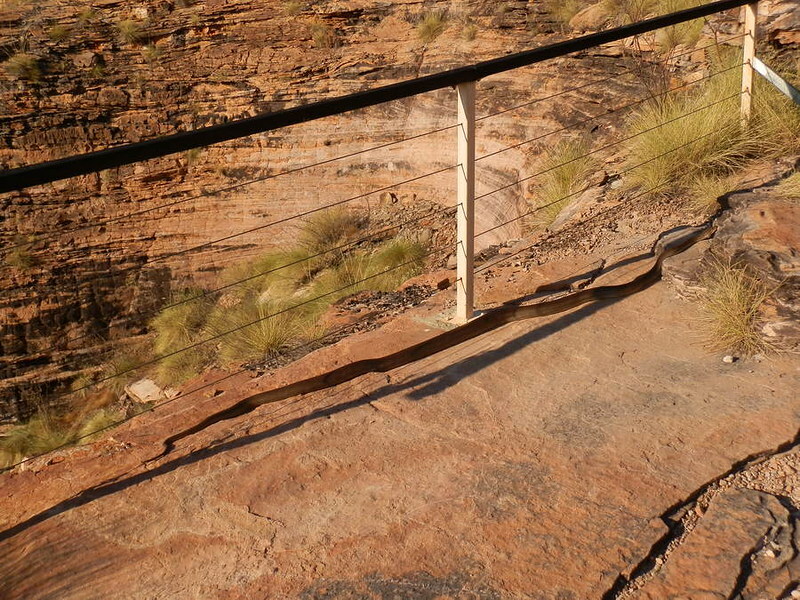 A three metre snake with rock fissure environmental camouflage! The watermelon race sounds like a hoot but the haystacking looks dangerous.